Stephen R. Covey Stephen Richards Covey (Salt Lake City, Utah, Estados Unidos, 24 de octubre de 1932 - Idaho Falls, Idaho, Estados Unidos; falleció el 16 de julio de 2012) fue un escritor, conferencista, religioso y profesor estadounidense conocido por ser el autor del libro bestseller: Los siete hábitos de las personas altamente efectivas. 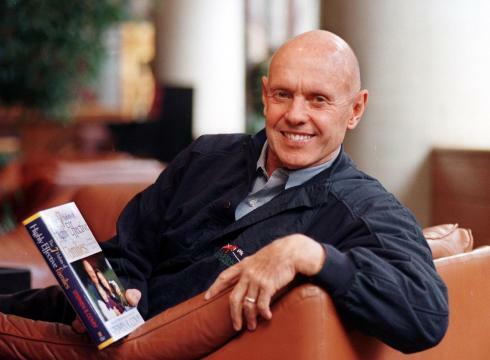 Stephen R. Covey (October 24, 1932 – July 16, 2012) was an American educator, author, businessman and motivational speaker. The Seven Habits of Highly Effective People. His other books include First Things First, Principle-Centered Leadership, The Seven Habits of Highly Effective Families, The 8th Habit, and The Leader In Me — How Schools and Parents Around the World Are Inspiring Greatness, One Child at a Time. He was a professor at the Jon M. Huntsman School of Business at Utah State University at the time of his death.